The Prince Rupert Royal Canadian Marine Search and Rescue team drops everything and is ready for departure within seven to 15 minutes. At any time of day, in rough seas or torrential weather, when they receive the call to help someone in distress on the water, the Prince Rupert Royal Canadian Marine Search and Rescue (RCM-SAR 64) team drops everything and is ready for departure within seven to 15 minutes. What may not be known to some, is that the crew in the red and yellow boat — who put in countless hours, leave their job or family at a moment’s notice, risk their lives for the sake of others — are all volunteers. For ten years, coxswain, or captain Marko Kessler, has volunteered his service for RCM-SAR 64, the biggest station in the north. “The first time you help somebody out and basically make a difference in their life that’s all the reward you want. That five minutes makes up for 10 years,” Kessler said. The captain of the rescue vessel is also the manager of Information Technology (IT) for the city and deals with unpredictable days in his career as well. “If it has power and it’s plugged into the wall chances are we’ll get a phone call for it,” he said. His scope of work includes departments across the city such as the RCMP, the landfill, water supply and sewage. Kessler was born and raised in the former Yugoslavia. When he wanted to study computer science there wasn’t a program available due to the ethnic conflicts and war in the early nineties. Instead, he looked abroad for more promising options and ended up studying at the University of B.C. in Prince George. 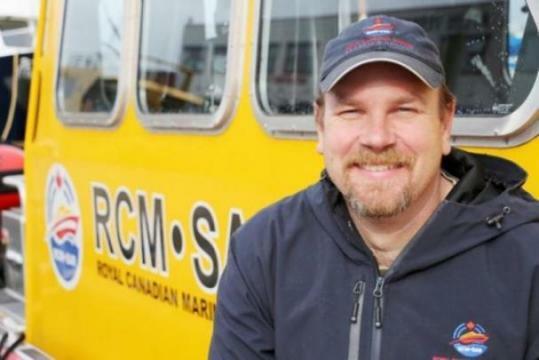 He was there for 10 years before he took the position with the City of Prince Rupert in 2006. When he moved to the North Coast, his wife stayed in Prince George to finish her culinary training. On his own in a new city, he wanted to find something to do to stave off boredom. He joined the marine search and rescue team. At the time, the patrol boat they used was a zodiac retrofitted to have a small semi-enclosed cabin with standing-room only. The crew fundraised nearly $600,000 to upgrade to the vessel they have today: a Type 2 Falkins Class vessel designed to handle near hurricane force winds and 15 metre waves. It holds a crew of 12, and three stretchers, and it has creature comforts, such as heating for the long hauls. The IT administrator used his expertise to maintain all the electrical aspects of the new vessel as well. “When we received the vessel, there were many minor electrical issues. This was because our vessel was one of the first ones in the fleet and brand new design. This actually gave me an opportunity to learn the system and replace nearly every single electrical connection and wire it up to our standard,” he said. From a volunteer gig that was supposed to keep him busy until his wife joined him, it has become Kessler’s passion. He said he’s spent close to 1,000 hours refitting a second boat Station 64 purchased to guarantee they have coverage every hour of the day. Once a week he trains with his crew and on Sundays they do maintenance. Once a year, he volunteers to inspect all the stations in the North, North Vancouver Island and the in-land station in Sicamous, and he was selected to participate in an international exchange in Scotland and Holland where he did cross training with rescue crews across the pond. He’s been to more than 100 missions over the years, and the ones that stay with him usually involve children. “The kids are near and dear to my heart, I do have two of my own, and whenever there’s a rescue with the kids that one sticks,” he said adding that he has a five-year-old girl and a three-year-old boy. For an added touch of compassion, the crew keep teddy bears in the front of the vessel. He said it’s made a big difference in cheering up the children they’ve rescued. Another mission Kessler remembers was when they arrived at a call in Big Bay where they found a woman with crushed ribs and a punctured lung after being crushed between two metal boats. Through rough weather, the crew managed to get her to Port Simpson. Kessler said he insisted on having the woman medevaced immediately. When the helicopter landed at the Prince Rupert Regional Hospital her second lung collapsed and the doctors got to her in time. “If it was a minute or two later she wouldn’t have made it. I talked to the doctors after and they said it was a good call on the helicopter,” Kessler said. The most challenging part of the gig at Station 64 is finding volunteers. A lot of time and energy goes into training volunteers and in a transient city people come and go after a couple of years. This September they are looking for new members. Kessler had never been involved in any aspect of search and rescue until he came to the North Coast and he loves it. Now, he teaches basic marine radio courses and pleasure craft operator certificates in the community. He was also out on Seafest for the Quick and Daring where competitors built a boat in a day and 24 hours later tried to race other handcrafted boats in the harbour. Last Sunday, with RCM-SAR 64, he trained with the U.S. Coast Guard and then stuck around for July 4 celebrations in Ketchikan. It may be a lot of work and dedication but saving lives on the water has many rewards.